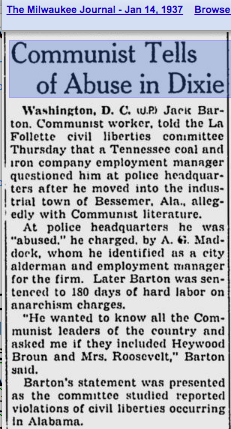 A typical newspaper story from 1937 shows the same thing as every other news story for the hundred years prior to 1971: communism, anarchism and socialism are essentially the same as a criminal gang. What changed in 1971? The one significant change was the emergence of a third party organized–not to loot–but to preserve the rights of individuals. Recall that the US was bombing civilians on the other side of the world with no declaration of war. Republican confiscatory prohibitionism was again weakening the economy, and oil producers in the former Ottoman Empire were taking advantage of America’s misplaced priorities to jack up oil prices. The Nixon Administration resorted to coercive and fraudulent wage and price controls. So David Nolan organized a group of dedicated volunteers to form the Libertarian Party dedicated to freedom, not coercion. The Non-Aggression Principle, penned by Ayn Rand in 1947 while working on chapter 10 of Atlas Shrugged, served not only as a beacon against diversion of purpose, but also as protection from mischaracterization and aggression organized by entrenched machine politicians. The McCarthy hearings had taught the Kleptocracy to tarbrush competitors as anarchist communists, and under that pretext unleash the coercive power of the political state against them. After all, Congress had specifically provided by law that anarchists–like persons infected with rabies–could be excluded from entry into the USA. But communism–like the Democratic and Republican parties soaked in its altruistic ideals and values since 1850, when the Manifesto first appeared in English–relies exclusively on the initiation of force. The Non-Aggression Principle thus protects the LP from aggression at the hands of entrenched looter parties and their captive political State. Their solution to the dilemma was the same as always: lying. Ways were found to have sincere-sounding fools declare that the non-aggression pact required bomb-throwing anarchism as a logical consequent. These “anarcho-capitalist” false flag parodies and infiltrators are almost invariably the same tools who bolster their credibility by howling that Germany’s National Socialist Party, the Union of Soviet Socialist Republics, and German Democratic Republic “weren’t really” socialist. The dinning against the Libertarian Party was so insistent and well-funded that even Ayn Rand, her mental faculties failing from old age and surrounded by manipulable sycophants, was eventually gulled by the sham. Get in touch for translations of political events in Central and South America.